PINOYMONEYVANTAGE | Personal Finance in the Philippines: Learn to Trade Foreign Exchange (FOREX) Currency? Learn to Trade Foreign Exchange (FOREX) Currency? A few days ago, I was contacted by one of the representative of University of the Philippines Junior Finance Association (UPJFA), a student organization based in UP Diliman in Quezon City. 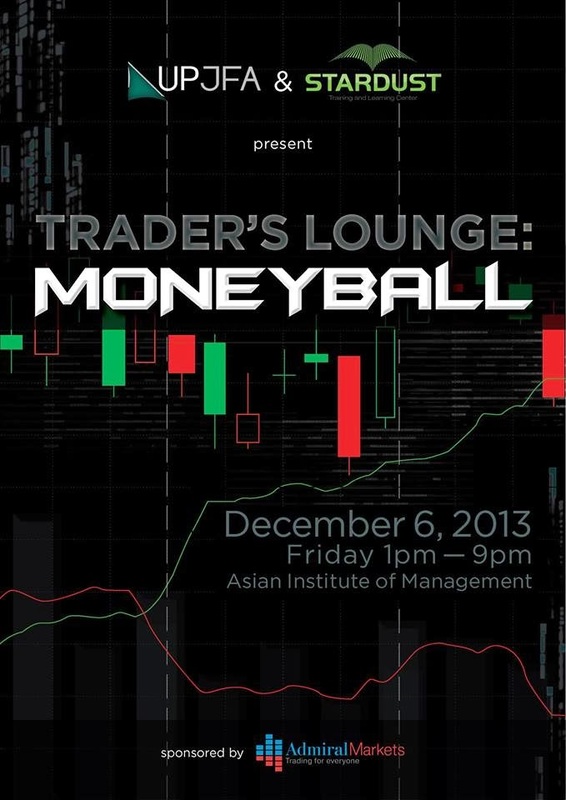 They will be organizing an event called the Trader's Lounge: MONEYBALL which will be held on December 6, 2013 at the Asian Institute of Management (AIM) Campus in Makati. This event is officially sponsored by Admiral Markets Philippines. This event aims to educate and give a first hand look on How Foreign Exchange (FOREX) Currency Trading. Learn to earn a profit and make money through this new investment vehicle works. For more inquiries details on visit http://stardustcollege.com or contact Mr. Tim Esguerra at this mobile number at 0917-6256722.